The start of the Golden Jubilee year was marked by a special Jubilee Spring Supper held in the April of 1986. The Mayors of Thamesdown and of Highworth attended as Guests of Honour and were joined by about fifty members and guests to enjoy an excellent meal and a very happy social evening. This proved to be a worthy precursor to a season of celebratory events. The various special bowling activities included, most notably, Men’s and Ladies’ matches against representative teams from their respective English, Wiltshire and Swindon & District Bowls Associations. These were all ably supported by the Catering Committee and helpers who provided meals of a very high standard, as befitted the occasions. The last of the formal celebratory occasions was the Jubilee Dinner in November, attended by not only two of the foundation members but also the Men’s County President. The Ladies’ County President had also been due to attend, but sadly, the death of her husband led to her withdrawal from the proceedings. Golden Jubilee memorabilia included a specially designed lapel badge, which proved to be popular among members and visitors alike. A plastic coaster was also designed and produced-the club badge in gold on a blue background-and one of these was given to each member of the teams we encountered during the Jubilee Year. The Jubilee Year also saw two significant improvements in the Club facilities. One of these, at a cost of £3,500 was the installation of an automatic sprinkler system for the green, to replace the much less effective and uncertain ‘whirligigs’ which made their sometimes faltering way over about two-thirds of the green during the silent hours, and all too often failed to stop as intended at the end of their run. The resultant flooded patches were good neither for the green, nor for the greenkeepers state of mind! The new system provides for the possible watering of the green in rain-like drops and in variable quantities, two or three times a night between close of play and the early hours. The green is the basic essential of any bowls club, and as noted earlier, a high standard was achieved and maintained at Highworth through the tireless efforts of Ted Drew from the early fifties until his retirement from this activity in 1972. Thereafter, the best of intentions and much hard work by a group of members seems to have led to misunderstandings, and a severe deterioration in the surface. Despite much dedicated, but possibly not always well directed, hard work, the features of the green continued at a low ebb until it was decided to retain and pay for some occasional professional assistance. Over a number of years a small band of volunteers worked tirelessly with the occasional help of the green contractors to raise the standard of the green to a level which was acceptable, if not remarkable, by the Golden Jubilee year of 1986. Subsequently, when the availability of voluntary labour to carry out this onerous task gradually dried up, it was decided to engage a greens contractor to do all the work that was necessary – cutting, moving strings, scarifying, tining, fertilising, seeding, treating for fungi, weeds etc., levelling and top-dressing. The actual management of green usage and liaison with the contractor continued to be a very important job for a club member, but the regular application of professional greenkeeping expertise soon began to show results, with a playing area well covered with fine grasses, a free running smooth surface and significant improvements in levels. The cost of this work makes substantial demands on Club finances, but the quality of the green now available (a frequent source of favourable comment by visitors) makes this a cost which must be willingly borne. It was not very long after this that the County, District and Vice Presidents Bowls Associations realised that the Club, with its excellent green, club-house and catering facilities, was a very attractive venue for hosting their matches. We have been pleased to be able to host a number of these matches over recent years, and gratified to receive many appreciative comments. The first pavilion, small though it was, found room to house a small cubicle to serve as a bar. 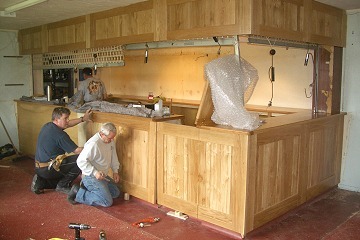 With the construction of the new club-house, an attractive and well-stocked bar was installed. For many years this was run entirely by voluntary help and since 1980 has opened regularly every evening of the week as well as at other times, as required. However, by the late eighties, with the bar now offering a very extensive range of refreshments, it was felt that it needed to be extended and updated. This was put in hand in the Spring of 1989, when the bar was stretched by about a half of its original length, a glass washer was installed, and two bottle fridges were supplied by the brewers, Ind Coope. In the middle eighties, the larger volume of bar stocks made it increasingly apparent that some more regular and positive form of stock recording and control was required. The Club management took a first step towards paid bar service by appointing a bar assistant for five mornings a week to devise, install and operate a suitable system. A retired VAT man took on the job and soon showed that the experience and knowledge gained from licensed trade visits on VAT matters could be effectively applied, behind the scenes, to the operating side of the business. Early in 1990, the then bar manager – a volunteer of many years standing – decided that he would like to be free of bar responsibilities and be able to enjoy more time on the other side of the bar. After consulting a number of members, it was concluded that to provide a good and reliable bar service, it would be necessary to make some modest payments to people to do it. With some caution, paid bar assistance was introduced, but as time went by, the management felt increasing confidence that paid bar service was a viable proposition. Over the years, the Club Management has been pursuing a continuing programme of clubhouse improvements. This has included the fitting of wall-to-wall carpeting virtually throughout the whole clubhouse, with new curtains at double-glazed windows. A major project of recent years has been the refurbishment of the kitchen. This was carried out, in-house, after the plans had been inspected by the Environmental Health Officer who, with one or two suggestions, expressed his satisfaction with them. The result has been a pleasant, attractive and easy to clean kitchen, with ample working surfaces and cupboard space; with a good cooker, hot cupboard, refrigeration and freezer units, it is now possible to produce and serve meals of a very high standard by skill and dedication rather than, as previously, by sheer miracle! More recently, thanks to the fund-raising efforts of many of our members, a completely new high-tech plastic roof has replaced the ageing and slightly leaky felt roof. With a secure roof in place, interior decorations could be safely updated. In 2009 the Club completed a major program of improvements, including a fully redecorated clubhouse, with new ceiling lighting, and an all-new professionally built bar. 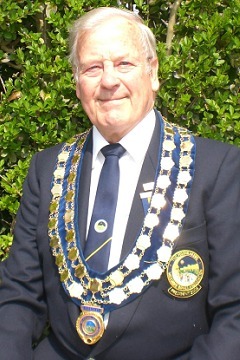 In 2008 the club was honoured to have long-serving Highworth member Mel Williams as the President of the Wiltshire Bowls Association, and Mel also became President of the South West Counties Bowling Association in 2010. All in all, we are now able to enjoy a clubhouse offering a standard of comfort and amenity which is among the best in the county. More recently, thanks to the organisational and fund-raising efforts of many of our members, a completely new high-tech plastic roof has replaced the ageing and slightly leaky felt roof. With a secure roof in place, interior decorations can now be safely updated. All in all, we believe we are now able to enjoy a clubhouse offering a standard of comfort and amenity which is among the best in the county.